These heavy-duty Push Plates, made from 16-gauge Type 304 Stainless Steel or .040 Rigid Acrylic PVC, ideal for protecting your doors from wear and tear associated with heavy traffic. Excellent for laboratories and medical facilities where cleanliness is an important issue. Stainless Steel #4 Satin Finish, 16 guage-optional drilled-countersunk holes for #8 3/4 oval head sheet metal screws (not included) or Undrilled for adhesive installation. 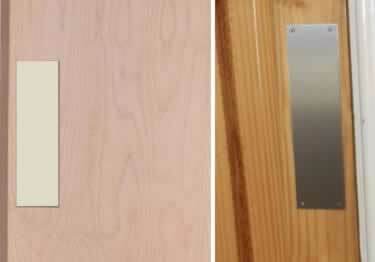 Hello, We are interested in purchasing some of your door push plates and had some questions regarding the product: 1) Do you supply the adhesive that should be used with the door push plates without the drilled holes and can you point me to which adhesive will be best for a stainless steel door? 2) We are interested in either the metal or black vinyl push plates and aren't sure which will suit our purpose better. We are using them on a stainless steel door in an effort to keep the door clear from smudges. Would one work better over the other? If we order both can we return the set we decided not to go with? Thank you so much! Is it possible to get an undrilled polished brass door plate that is flat and 2 inches wide by 9 inches long? Heavy duty door push plates provide a sturdy, easy to clean, decorative finish for your heavy traffic area. Available in 60 colors of Rigid Acrylic PVC or Stainless Steel. Indoor/outdoor mat traps dirt, water, slush & snow, significantly reducing maintenance costs & damage to your facility floors.